Moles can be unattractive, cause discomfort and be a cause for concern. If a mole becomes itchy or painful, it is wise to seek counsel from a doctor. Moles can be completely harmless, as when they have been around and dormant for years, or extremely dangerous. Treatment of moles include removal or observation by a doctor over time. A mole is a skin condition that forms from a benign growth of colored cells. Moles may appear as early as the first year of life, with more growing well into an adult's second or third decade. Moles may increase in number if a person spends a significant amount of time in the sun, gets severe sunburns as a child or does not practice safe sun care (such as use of sunscreen, hats and proper coverage). According to the Mole Melanoma website, the more moles a person has the more likely they may contract malignant melanoma, a form of skin cancer. Moles can be dangerous if they have asymmetry, border irregularity, color variation or show an increased diameter. Asymmetrical moles are uneven and are a sign that one area is growing faster than another part of the mole. Border irregularity involves borders that are irregular, hazy or not well-defined, which can indicate uncontrolled growth. Variation of color, especially if red, gray or white areas appear, should be medically evaluated. Moles usually stay relatively the same size after the approximate age of 20. If a diameter changes a lot after this age, a doctor should look at the mole. In addition to the symptoms mentioned above, itchy moles are a reason to get a medical evaluation. Not all itchiness may be a sign of cancer or a serious medical condition. Moles may be irritated by shaving, scratching them or by moles rubbing up against clothing. If the mole has looked the same for years, and is only itchy after an acute incident (such as shaving or scratching), it may be nothing to worry about. If the mole is new, has had no contact with razors or fingernails and itches all the time, a doctor should be consulted. All the moles with symptoms mentioned above can be painful. Pain or discomfort is often the first sign that a person notices when he thinks his mole might be dangerous. Moles often can be itchy, achy or cause pulsating pains. Doctors should be made aware of the pain location, its duration and its severity when discussing the mole. Treatment of moles usually involves removal or observation of the mole over time. The methods to remove a mole include shave excision and excisional surgery. A shave excision involves a doctor numbing the area around the mole and using a small blade to cut around and under the mole. An excisional surgery cuts the entire mole out, along with some surrounding tissue and skin. The doctor uses a scalpel or punch tool and then sutures the hole closed on the skin. If a mole is not cancerous or of concern for the doctor, he may choose to watch it over time to see if and how it changes before deciding on surgery. 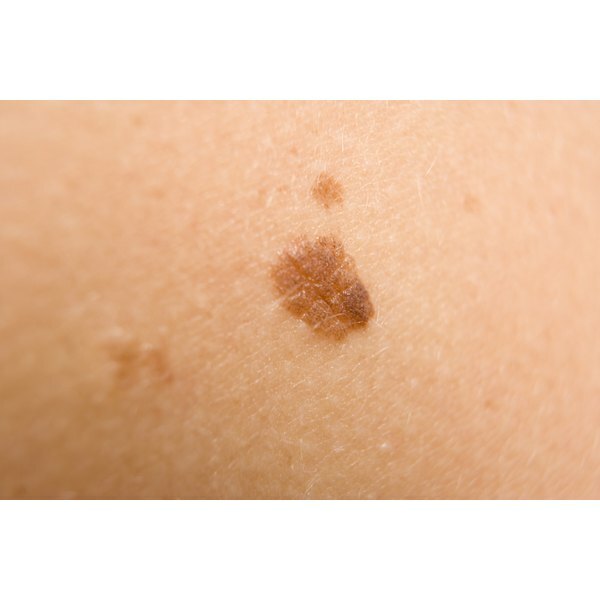 Mole Melanoma Site: What is a Mole?